In an ensemble program like Rebels, there is often a difficulty in balancing characterization with storytelling, and while the show has at least attempted to spread the focus among its core characters, inevitably the strongest episodes have focused on Ezra Bridger. The latest offering, “Empire Day,” certainly falls into this category and delivers an installment that reveals not only a sizeable chunk of Ezra’s backstory but also a great deal of the Empire’s plans for Lothal. Opening in the near barren landscape of Lothal, “Empire Day” begins with another Jedi training sequence of the young Padawan Ezra Bridger. In this case, Kanan is attempting to teach his charge how to make a connection with a local feline creature called a loth-cat. Having lived through Order 66, Kanan is hyper-aware of the importance of connections and is determined to impart that knowledge to a reluctant Ezra. The boy has little patience for this part of the training, and for reasons revealed later in the episode, has good reasons for his hesitancy to let others (even loth-cats) truly know him. While the events of “Empire Day” certainly serve as conduit into Ezra’s past, they may also allude to potential future events of a personal nature. If one takes note of Kevin Kiner’s brief use of Princess Leia’s theme from A New Hope that accompanies a lingering glance by Sabine toward the boy as he trains with his master in regards to making connections, one would not be out of line to infer deeper meaning to the moment. Even still, it will be relationships from the past that come to the forefront in “Empire Day.” Named after an Imperial holiday commemorating the end of the Clone Wars and Palpatine’s foundation of the Galactic Empire, this episode delves deep into Ezra Bridger’s life before meeting the crew of the Ghost. Personal information on the boy is rampant throughout “Empire Day” as we learn that Ezra shares a birthday with the Empire (and is therefore only a few days older than the Skywalker twins) we are told the names of his parents (Ephraim and Mira), and it is revealed that those parents were rebels themselves who operated an underground broadcast that spoke against the Empire. The source of much of this information is a Rodian by the name of Tseebo, a former friend of Ezra’s parents and an Imperial data technician whose cybernetic brain implants have given him access to the Empire’s five-year-plan for the planets of the Outer Rim. Fortunately for our band of rebels, Sabine has the technical acumen to access the data. However, Tseebo’s knowledge has also made him the subject of an Imperial manhunt and forces Kanan, Sabine, and Ezra to make smuggling the fugitive out of the city their highest priority. But on “Empire Day,” this task will be even more difficult than usual as Lothal has undergone a massive influx of Imperial dignitaries who are now on hand for a celebratory parade and the introduction of Sienar Systems’ advanced TIE fighter. And while the citizens of Lothal are obviously less than thrilled to be commemorating the birth of the Empire, the presence of VIPs ranging from Commandant Aresko and Taskmaster Grint to Agent Kallus and the Inquisitor himself makes compliance a necessity. Also in attendance is Minister Maketh Tua who seems to be channeling Effie Trinket from The Hunger Games as she attempts to summon enthusiasm from the crowd by overwhelming them with her own. As an aside, Kevin Kiner’s use of a stylized version of the Imperial March as source music during the parade is an inspired choice and exquisitely evokes a sense of 1940’s-era propaganda (thank you to Dan Zehr for this insight). As this environment is no place for a wanted Rodian with proprietary knowledge of the next half-decade of future Imperial plans, Kanan, Sabine, and Ezra commandeer an Imperial troop transport and make their way to the city limits in hopes of connecting with the Ghost. A thrilling chase sequence ensues as the rebels are pursued by Agent Kallus and a squadron of Imperial Stormtroopers on the ground and a quintet of TIE fighters (led by the Inquisitor) in the air. “Empire Day” employs a few more familar tropes during these scenes as Sabine plows right through a roadblock set up by Commandant Aresko and Kallus’ efforts to stop the rebels leads to the ISB agent running across the top of the transport like a bandit in an old western. Finally, Hera, Zeb and Chopper arrive in the Ghost to rescue their friends, and after a brief lightsaber vs blaster skirmish between Kanan and Kallus, the rebels are reunited on the starship with Tseebo in tow. But it’s not over yet as the Inquisitor’s TIE opens fire on the Ghost and appears ready to cripple her through a series of successive blasts. But the blasts also seem to have positive effect as Tseebo shakes free of his cybernetic haze just long enough to reveal that he knows what happened to Ezra’s parents. 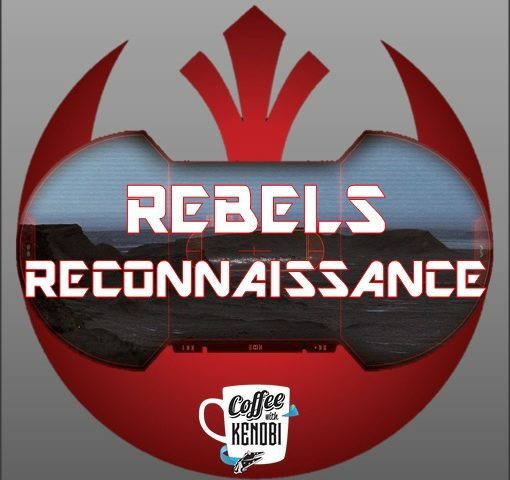 Eschewing the typical Rebels format of self-contained episodes, “Empire Day” ends on a cliffhanger and we are left wondering until next week what will become of our heroes and what Tseebo really knows. Next article Entertainment Earth Donates $100k to Toys for Tots! “Empire Day” & “Gathering Forces” Analysis.